Looking at new design trends and ideas to incorporate into our own manufactured homes is a favorite past time for us. It’s not always easy to find manufactured home specific ideas but we’ve managed to put together some of our favorite mobile home design trends for 2018. Trends come and go and what was cool 20 years ago seems to be coming back. Have you noticed clothing from 1995 in the stores lately? I knew I should have kept those lace embroidered Levi’s from my high school days. Good thing I still have my Doc Martens! We went from neutral earthy tones to bright white with teal and orange and now we are right back to the neutrals. 2018 is bringing back those warm and relaxing colors that have been cast aside the past few years. Browns, bisque, and dark grays are popular which is awesome because they make great backdrops for those pops of color that we love to use to pull a room together. 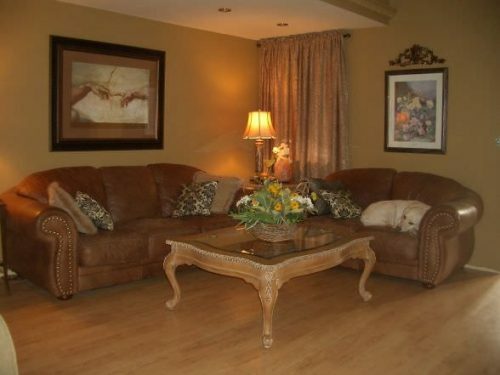 Neutral colors don’t show dirt and dog hair as much and that’s why it’s one of my favorite mobile home design trends. Neutral colors make a great backdrop. Retro and minimalism have been a big design trend for quite awhile but there’s a new twist – instead of going retro crazy the designers are holding back a bit. Let’s face it, minimalism and retro do not make for the most comfortable furniture. 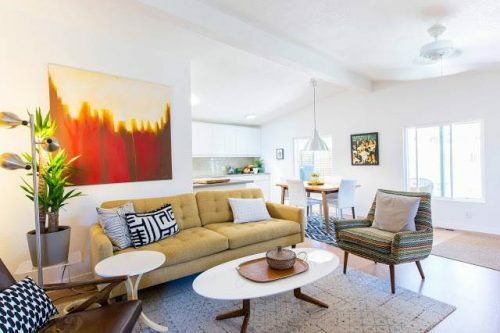 Retro is def one the mobile home design trends of 2018 but the pros are incorporating a few choice pieces into the room and putting emphasis on comfort and relaxation like the homeowner did below. That sofa is thick and inviting, the chair isn’t so low you need help to get out of it. If you would like to see more Retro inspiration check out our article: Modern Manufactured Home Remodel For A 1991 Fleetwood Double Wide. 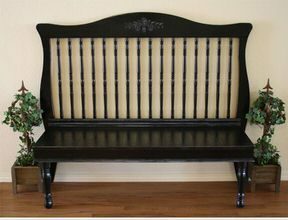 Love these retro furniture pieces. Natural light will always be one of our mobile home design trends. It is absolutely the best way to make a space look bigger and, well, better. If you are lucky enough to have plenty of windows, open up those shades and let the light in! If windows aren’t plentiful, trying using the improved LED light bulbs or upgrading your light fixtures to give the illusion of natural light. Mirrors work great, too. 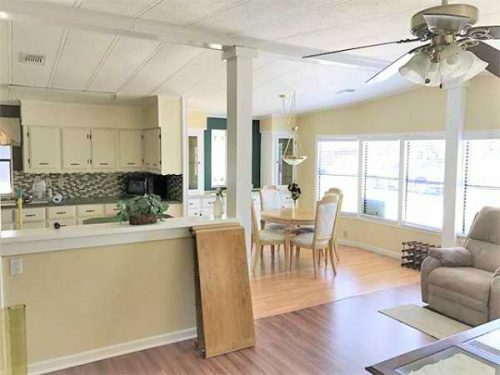 Natural light brings out the yellow in these walls. More feminine patterns with pastel colors and florals are making a comeback. Not too much, though, you just want a little pop here and there. Think ‘shabby-chic meets modern minimalism.’ A splash of pink or floral curtains isn’t just for the nursery anymore! 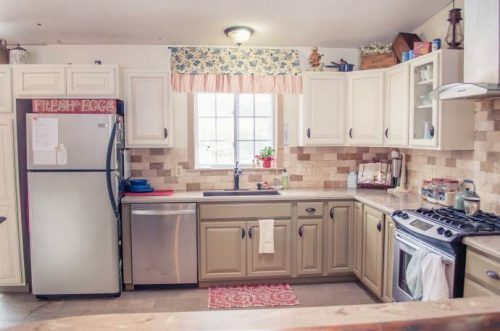 Floral and pastel blend together in this kitchen nicely. We’ve gone from small word decals to complete wall murals. This time, it’s all about texture, especially stone or wood. 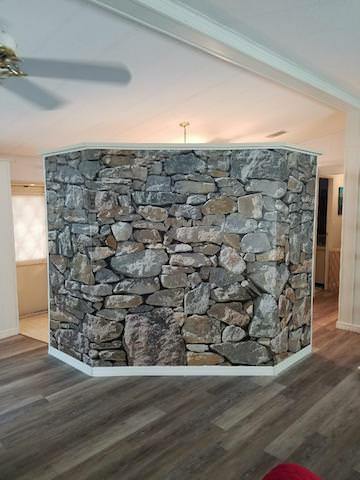 Whether it’s a faux stone wall or something more 3-D like, now is the time to give your walls new life and add your own sense of style to your manufactured home. Related: The Future of Mobile Home Design? We as a society are becoming more and more conscious of our duties to recycle and reuse things. With the popularity of Pinterest there are more ideas than ever floating around to recycle, remake, reuse, and repair things. We think recycling and reusing are one of the mobile home design trends that are here to stay and that’s awesome. Be sure to follow us on Pinterest to see some of the ideas that we love! 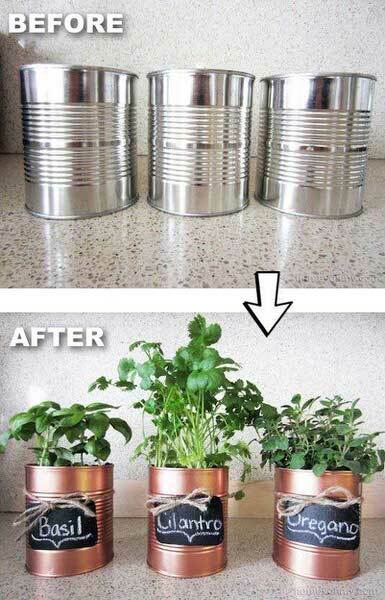 A good way to use those tin cans. Have a crib in storage? Mobile home design trends this year is all about finding comfort and incorporating it into your manufactured home. 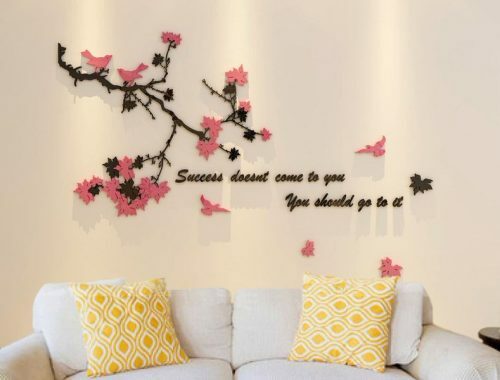 We want to see your decorating ideas! Email or comment below.